Earn up to 117,568 reward points. 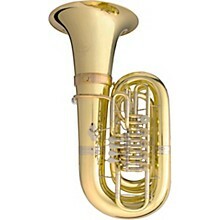 This CC-Tuba is a 5/4 instrument equipped with 5 rotary valves and constructed of yellow brass. It has a handsome clear lacquer finish and a .748" - .827" and an 18.898" bell. This B&S 3098 series tuba is a great-sounding, easy-playing professional instrument. It is equipped with a corrosion-safe gold brass leadpipe and nickel silver inner and outer slides. It features rotary valves that are equipped with 3B ball bearing linkages on both ends of the valve connecting arm to provide the ultimate in smooth and quiet operation. Order now and get the instrument of a lifetime.